Is it just me or are you seeing this everywhere too? They look good, I admit. And I may even be guilty of designing one myself. 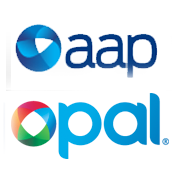 Here in Australia, a few of the more common examples are Opal Card, our new transport ticketing system, and the AAP logo. Similar, don’t you think? I guess the main differences are the white space shape left in the middle. For AAP (Australian Associated Press) this is a triangle. For Opal, the white space is a diamond. I think Opal is the more elegant of the two. The soft serifs on the P, A and L also reflect the smooth corners of the diamond white space. By the way, here’s a pretty similar version I found on a collection site. Don’t get me wrong, I’m not suggesting anyone has breached copyright here. When a good idea gets going, people get onto it. Graphic design works in trends like this. As long as it’s sufficiently original, and registered, you’re okay. Even Shutterstock and iStock are selling nice where do-it-yourself designers can buy and customise an eps file to create their own. 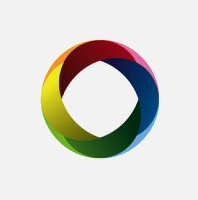 Oh, and here’s a tutorial about how you can make the Opal Card logo (below). It’s by the illustrious Abduzeedo. But if you have Illustrator, it is fairly easy. Just make sure you change it a bit so it doesn’t look exactly like something else. The Opal Card logo is very similar, but it doesn’t have the wedge of pink at the top right, nor does it use yellow in its colour pallette. Opal sticks to a simple four colour scheme of orange, red, blue and green. Also the circles have been set further apart making the ring look thicker and the diamond in the centre look smaller. What do you think? Spotted any logo trends lately? This entry was posted in Blog by Danielle Spinks. Bookmark the permalink.